MOSCOW—At the top of the bell tower of Danilov Monastery, fruit flies buzz around the dark metal bells and a cool breeze sweeps off the nearby Moscow river. 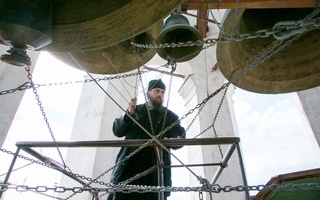 The 11 bells hang in heavy silence, far above the hustle and bustle that can be seen all around the walled-off grounds of Moscow’s oldest monastery. The bells, too, seem like a part of the city’s ancient history. But they are merely a substitution for the originals which now hang in the Lowell House bell tower. Charles Crane, an American businessman, bought the bells from the Soviets in the 1920s, saving them from ruin. He gave them to then University President A. Lawrence Lowell in 1930. For almost 70 years, while Lowell House residents rang the Russian bells every Sunday, the Danilov monastery was silent. It was completely shut down by the atheist Soviets in 1930 after the Bolsheviks overturned the tsardom. Turned into a prison for children, the Soviets killed or arrested all of the monks remaining in the monastery by 1937, destroying the icons and graves on the grounds. Almost 70 years later, the Soviets have been ousted and much has changed. A free market reigns in Russia and the Danilov is an operating monastery once again, as Russian Orthodoxy makes a rapid comeback from the days of Communist atheism. Since its reopening, the monks of the monastery have been busy rebuilding its churches and gathering its scattered icons. While they’ve been successful in retrieving a number of sacred relics—including the remains of the monastery’s founder, St. Daniel—their attempts to get the bells back from Harvard have failed. This year, with the celebration of the 700th anniversary of St. Daniel’s death, the monastery has renewed their campaign to get their bells back from Lowell House. Nearly 4,500 miles apart, this quaint center of Russian orthodoxy and America’s bastion of higher education are unlikely adversaries in a tug-of-war over tradition. From the very top of the monastery’s pink stucco tower, Father Roman Ugrinko, the senior bell ringer, points out the Moscow sites that have become familiar to him during his three years at Danilov—the Zil auto factory, the bend of the Moscow river, the sparkle of the Kremlin’s gold onion domes in the distance and the imposing Soviet-style cardboard box buildings that elbow the skyline.